Pot meets kettle when the Oily One turns a blind eye to the legalised gerrymander known as the Epsom electorate. If it is indeed subterfuge, maybe it's a case of fighting fire with fire. I can understand the need for $3k of Edgelering. Before during or after an election could mean "any time, ever". But Parliament didn't say that, so does "before" create an implied term? Free WiFi isn't food or drink or provisions (assuming the latter refers to food and the like). Is it entertainment? And what's "corruptly". Can you influence voters uncorruptly, e.g by advertising? Also, any internet site with ads is essentially providing information and entertainment in return for a readers attention to the advertising. If a party runs banner ads on an entertainment site, is that "treating"? the first part of Jim’s blog on the making of the documentary went up on the Attitude website today. Well, duh. A lawyer didn’t breach his client’s confidence. I would have been astonished had Graeme answered Cameron Slater’s questions in any other way. To imply otherwise is either disingenuous or stupid. I did not feel that Cameron’s reporting about me in any way suggested any impropriety. His reporting seems entirely fair. Good insider piece here by Gordon Campbell. I can't see why Parliament wouldn't mean "at any time". Treating, after all, is basically bribery, and I can't see why it should be acceptable to bribe a voter to vote for you at any point in the electoral cycle. Although, as one Graeme Edgeler pointed out on Tuesday, the treating provisions are a bit archaic. Anyway, I don't think free wi-fi would be treating, I think it would simply be s216 bribery, if it were illegal. I'm still chuckling at Bradbury's clumsiness. I would, however, be interested in the political background to Whaleoil’s abrupt shift of sympathies away from Dotcom, who he once described as a victim who had exposed troubling issues of state. Hardly abrupt, Oil has been acting pretty much as Key's proxy on that issue for at least a year. For those wishing to plumb the depths of the grease trap there are probably earlier examples, but from ten months back here's "The sooner this fat german crook is put on a plane the better." The Prime Minister hands out free gifts to journalists regularly. They are accepted and (in most cases) not disclosed. That may not be "treating" but it's certainly a matter of public interest, and I'd like to know why the media don't tell us about it. Because they value the gifts more than their ethics, I suppose. Fair enough. I thought the "refused to talk" and "constant refrain" parts were somewhat unfair to you. How might the Internet Party do in our political context? Centre-right blogger Cameron Slater thinks that the Internet Party is excessively narrow in pursuing its planned political niche and that it might therefore remain an unelectable microparty. Is he correct about this? 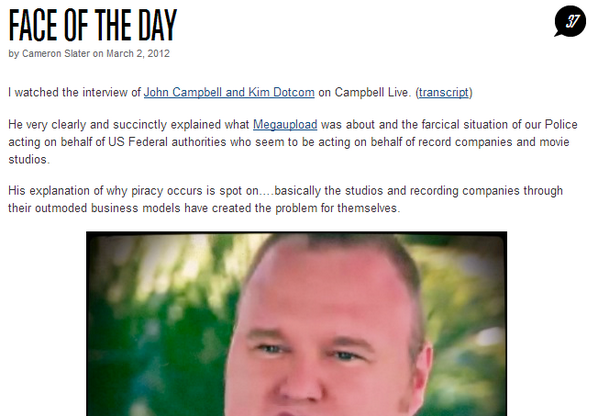 Dotcom's proposal sounds similar to that advanced by the German Pirate Party and its cyberlibertarian counterparts in New Zealand, Sweden, Austria, Denmark, Finland, Ireland, the Netherlands, Spain, Australia, Brazil, Belgium, Bulgaria, Croatia, the Czech Republic, Estonia, France, Greece, Hungary, Iceland, India, Italy, Luxembourg, Mexico, Nepal, Norway, Slovenia, Poland, Switzerland, Tunisia and the United Kingdom. Of these, state German Pirate Parties have won state legislature and city council seats, the Czech Pirate Party has a Senate and city council seats, the Iceland Pirate Party has three parliamentary seats in its national parliament, the Swedish Pirate Party elected two European Parliamentary members and the Swiss Pirate Party has two municipal councillors while the Catalonian Pirate Party has two municipal councillors. So, parliamentary and local council representation does seem possible, although it seems to be the case that cyberlibertarian parties have had their greatest success in European politics, particularly within the German state and municipal context. Could that be replicated here? There have been considerable public protests about Key administration online surveillance and data interception legislation and its potentially chilling effects on government transparency and accountability and civil liberties. However, the federal German Pirate Party failed to pick up Bundestag seats due to its political naivetie and absence of legislative experience. Still, given that former Scoop parliamentary press gallery journalist Alistair Thompson is interim party secretary, the Internet Party may be able to sidestep these potential teething problems. But is New Zealand too economically underdeveloped for such parties to be politically viable? Or could the Greens end up incorporating cyberlibertarian concerns into their greater party agenda? The German Pirate Party currently has forty-five elected representatives in German state parliaments. However, it has failed to gain federal Bundestag representation. Hardly abrupt, Oil has been acting pretty much as Key’s proxy on that issue for at least a year. He certainly has. The amusing part is when you look at his previous, highly supportive writing about Dotcom and his predicament. See the pics. Imagine the communications from Judith Collins’ office. 2. $8k a month is bugger all. You get what you pay for. So KDC has done well to not sign-up to it. Having said that, the party should have issued a distancing statement yesterday. from what I understand, the directions don't come so much from JC's office. A former staffer of that office was the link. Now it's all about this Ede fellow. The amusing part is when you look at his previous, highly supportive writing about Dotcom and his predicament. 8k's a lot for what Bradbury was offering. Sounds like a classic case of “either you’re with me or you’re with the filthy Reds under the bed”. 8k’s a lot for what Bradbury was offering. I’m picking that’s the high tide mark for Bradbury. If this ‘splash’ was what was sought by Dotcom, his problem isn’t his consultant, it’s his ambition. I'm wrong, the Oil's flip on Dotcom was, as you say, most abrupt. And I'm also wrong in claiming that his slagging goes back at least a year. The word from on high obviously descended last March 2nd. Can we stop using centre like that. Children might pick up bad habits. The guy has 15,000 young people turning up to his album launch party on Monday. I think he has ways. I really do think that a lot of people -- including Whaleoil, who I appear to have angered, and Bradbury himself -- have misread the nature of Dotcom's cut-through. Of course, we all know that Kim Dotcom was never planning to do his launch at the Cloud, it was the old book two venues then "ZOMG!!! Our venue is to small! Lucky this bigger one is available!!!!" trick. He is a canny and natural politician. Dare I say it, Dotocm has exactly the same appeal as John Key - the anti-politician politician - and he appeals to same sorts of demographics. No, 15k people registered for free tickets to a free party by a well known rich party guy. The only kind of cut through that shows is that people like free parties and hope other free stuff will accompany it. My views on Kim Dotcom are mixed and nuanced, but I deeply like the fact that he treats my boy as a VIP. Fair point. And certainly I agree with Bradbury’s entirely reasonable point that Gen Ys Nats will be put off by the prospect of Colin Craig’s influence. I was, somewhat hamfistedly, suggesting Dotcom might invest in better strategist. Ones who don't make the story about themselves.